Cherry Court Motor Lodge has 15 superior modern, spacious, clean units. The options include: studio, one and two-bedroom units. All our well-equipped, refurbished motel rooms are self-contained and non-smoking. Free Wireless Internet access through Optical fibre (limits may apply). Cooked and continental breakfast can be brought to your room. Cots are available at our motel. Cherry Court Motel has one unit available with accessible facilities. 1 queen-size bed and 1 single bed side-by-side. Flatscreen TV with Sky 50+ channels, phone, fridge, microwave, full cooking facilities (in most units), shower in the ensuite. Clock radio, heating, electric blankets, iron, hair dryer, Free Wireless internet access. Two different rooms (one bedroom + bedding in the living area). Queen-size bed and 2 single beds. Flatscreen TV with Sky 50+ channels, phone, full kitchen, clock radio, heating, electric blankets, iron, hair dryer, shower in the ensuite. Sleeps up to 5 people. Free Wireless internet access. Three different rooms (2 bedrooms + bedding in the living area). These are configured as two connecting rooms so have the convenience of 2 ensuites with showers. Two queen-size beds and 3 single beds, 2 TVs, 1 full kitchens and 2 entrances. Flatscreen TV with Sky 50+ channels, phone, clock radio, heating, electric blankets, iron, hair dryer. Sleeps up to 7 people. Free Wireless internet access. Our conference room can seat up to 15 theatre-style. It is ideal for small conferences, meetings, arbitrations, product demonstrations and more. The room is located in a separate building to the motel, adjacent to the swimming pool. Plenty of off-street parking is available. Accommodation is available for delegates and presenters at the Cherry Court Motel. Full catering can be provided as well as a selection of conference equipment. Please enquire for bookings or more information. 1. Cancellations made up to 7 days before the booked date incur no charges. 2. A minimum of 7 days' notice is required for all cancellations. Failure to provide Cherry Court Motor Lodge with 7 days' notice will automatically imply liability and may result in the total amount for the booked accommodation being charged. 3. A 20% administration fee may apply to all changes and cancellations to reservations. 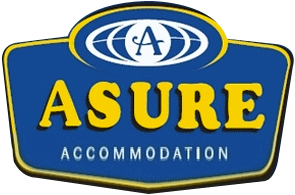 Members of the nationwide Asure Accommodation Group which consists of quality, self-contained and serviced, independently owned and operated accommodation properties throughout New Zealand. ASURE Loyalty Programme - stay 9 nights at any of the Asure properties throughout New Zealand and receive 0 credit off your 10th night.